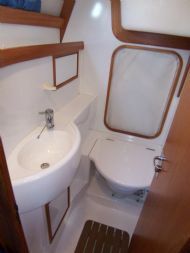 Production 42-foot monohull aft-cockpit fibreglass cutter from Rustler Yachts, Ltd.. Designed by Stephen Jones. Built in the UK. Produced from 1999. Measure of the boat's up-and-down jumpiness due to waves. Uses displacement, LWL, LOA and Beam. How likely a boat is to recover from a capsize, based on beam and displacement. A quick and dirty measure of offshore suitability. Down from 2 is considered increasingly quick to recover. Above 2 is increasingly likely to stay turtled. Beaminess (lower L/B) usually adds to initial stiffness and interior room, but also makes for a rougher ride and greater difficulty recovering from a capsize. Red Ruth is Hull Number 001.